Lawn Solutions Australia (LSA) is a hand-picked group of Australia's leading turf growers and adhere to the same stringent, nationally endorsed standards. This accreditation process is subject to continuous review and improvement, and all growers are audited on an ongoing basis to ensure compliance. LSA's commitment to quality and service is backed by our industry-first 10-year Customer Product Warranty. 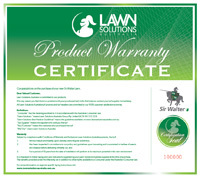 The warranty certifies that turf supplied by a Lawn Solutions Australia member has been grown and harvested to stringent standards, is free of weeds and disease on delivery, and will perform to it's maximum potential in it's new environment (subject to conditions). Landscaping expert and TV gardening personality, Jason Hodges, says the launch of LSA is the biggest thing to happen to eh Australian turf industry in years. "Across Australia, you can be confident that your local LSA grower can supply the best lawn to suit your growing conditions, backed by the 10-year Customer Product Warranty." LSA have exclusive arrangements with the world's leading turf breeders and research facilities, including Texas A&M University and the University of Georgia in the United States of America. Our strategy is to introduce new varieties only if they have clear and distinguishable environmental advantages over existing varieties, and only after they have been tested for Australian conditions. To view a sample LSA warranty certificate, please click on the thumbnail below.